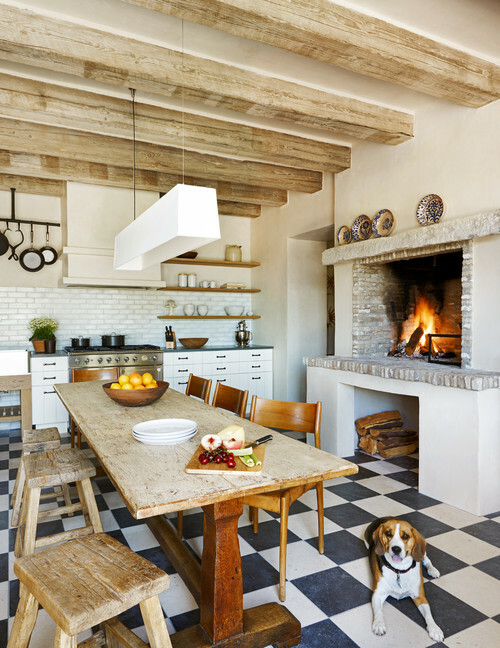 Sick and tired of slick, white, modern, minimalist, streamlined kitchens? (Or maybe you never liked them in the first place?) 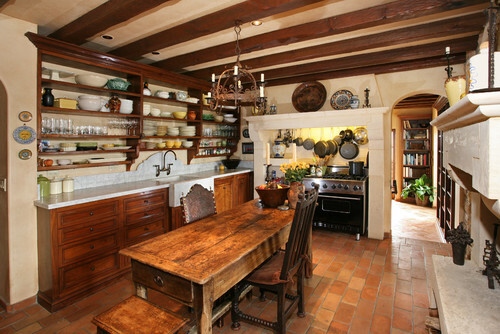 If the kitchen is the heart of the home, shouldn’t it be cozy, homey, warm and inviting? 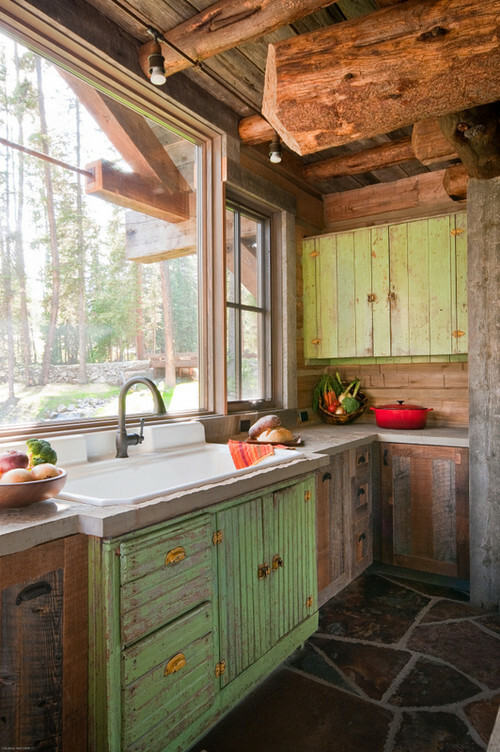 If that’s your mindset, then the rustic kitchen is your dream kitchen. 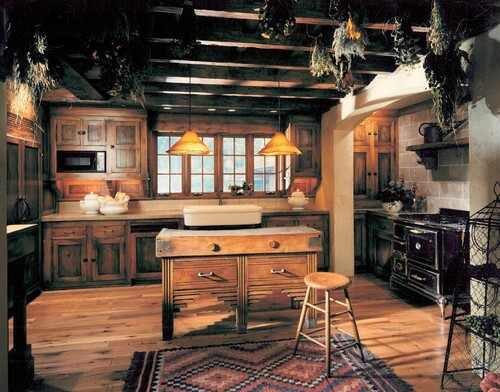 Rustic kitchens, AKA country or farmhouse kitchens, are the antithesis of modern, minimalist styles. 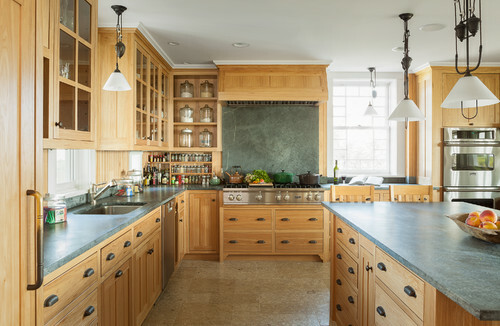 Their charming style is defined by many elements; we’ve compiled a list of the eight features that are most necessary in creating the character-filled kitchen you desire. 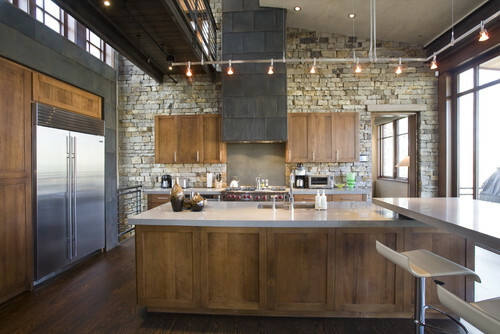 Distressed wood, weathered counters, patina’ed metals, textured walls. 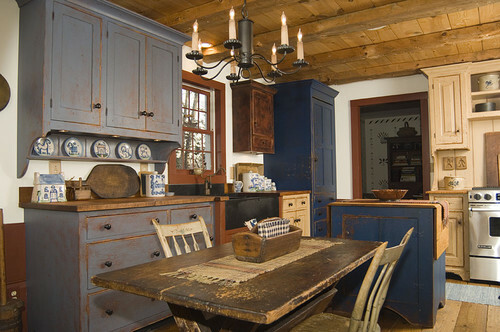 Older, worn-in fixtures give the room a lived-in look and feel as well as genuine character. 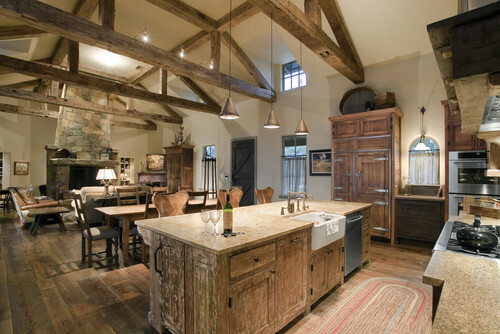 Rustic style tends to avoid the uniformity and symmetry that has become popular in more modern decorating. 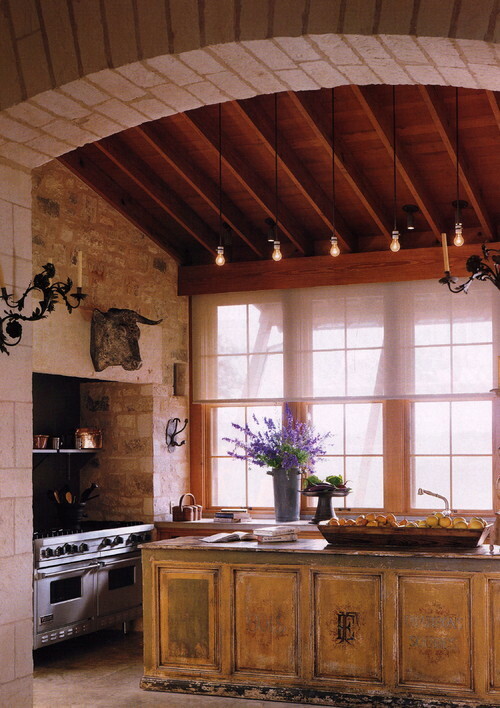 The shapes of the kitchen fittings – and the kitchen itself – must fit the rustic scheme. 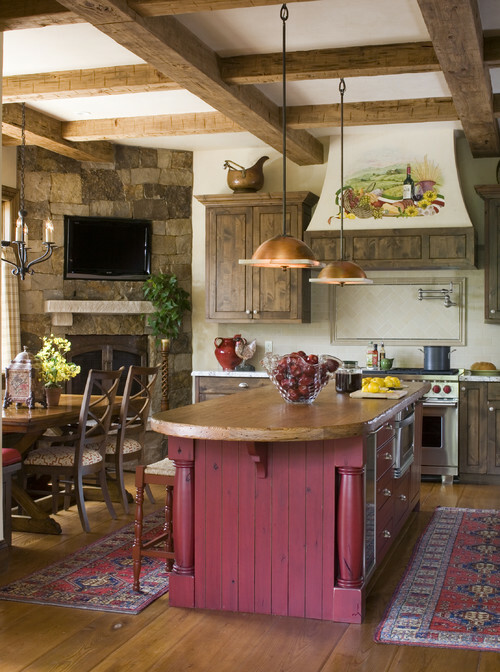 Vintage and country-inspired faucets, light fixtures, pot racks, bridge or wall-mount faucets, apron-front (farmhouse) sinks, arched walls… pick one or all for a truly rustic result. Sometimes it’s the small touches that are most necessary for proper decor schemes. 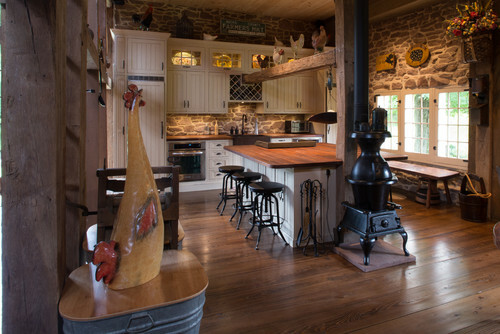 Rustic hardware and accessories – like roosters and weather vanes – effectively up the charm factor in any kitchen. 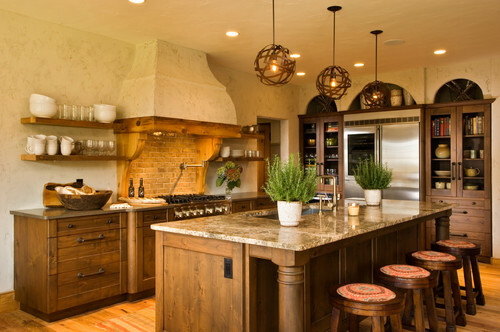 Every rustic kitchen should ideally feature copper. 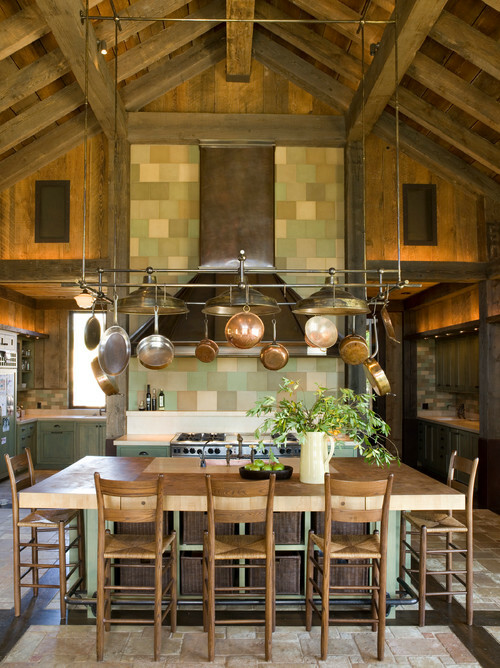 Its warm hue, natural patina over time, and farmhouse feel – copper pots hanging from the ceiling, anyone? – make it a rustic staple. 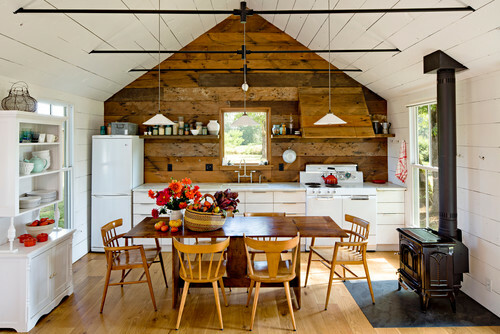 Farmhouse kitchens should – obviously – feature farmhouse-inspired pieces. 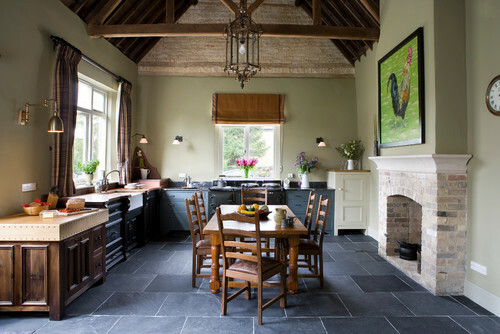 Farmhouse sinks, farm tables, art or accessories associated with farms… if it belongs in a true farm kitchen, it belongs in your rustic kitchen. Let it all hang out. 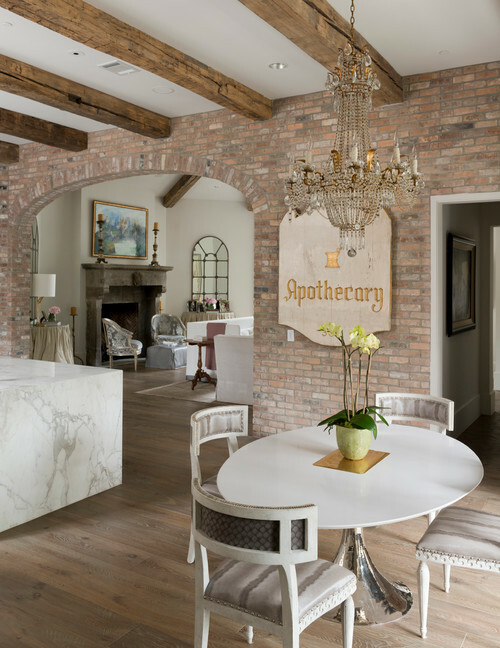 Leave (or add) exposed brick or beams and incorporate natural materials such as slate and soapstone (a material that also gets points for the “patina” category). 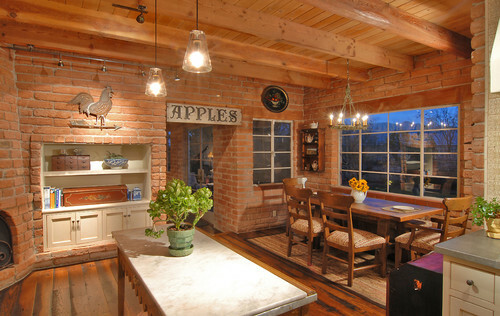 Kitchen by Spot Design, Inc. In the good old days, farm wives cooked over real fires (and not the gas-powered ones found on today’s ranges). 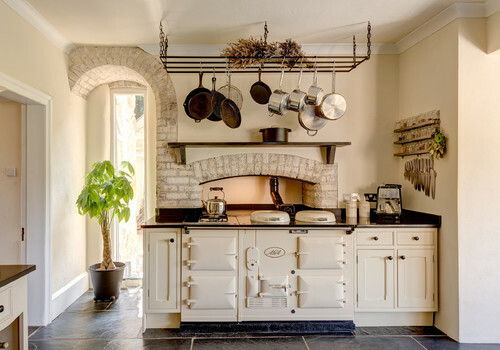 While you shouldn’t give up the convenience of modern cooking for the sake of style, try adding a fireplace or furnace (or an awesome pot-bellied stove) for crackling warmth and comfort. The effect would not be nearly as striking. Try to keep everything as close to the design theme as possible – authentic finishes, enameled or panel-ready appliances, attention to detail. If it’s not authentic, it won’t be as genuine as you’d like it to be. 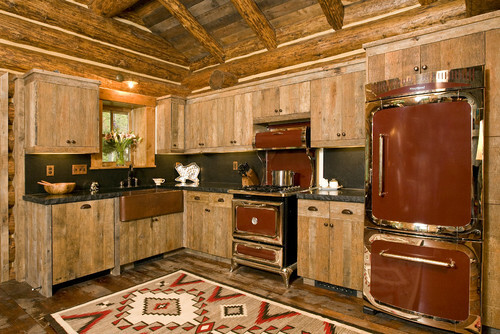 What’s your take on rustic kitchens? Do you dream of one or would you rather stick with more contemporary design?